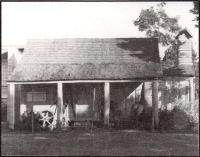 The Beaudesert Historical Society and Information Centre was founded on 11th April, 1961 and has had its headquarters in the Historical Complex situated in Brisbane St. Beaudesert. The building also houses the museum collection. The Pioneer Cottage, originally built in 1875 by a pioneer on his Kerry property, was given to the society by his grandchildren and rebuilt entirely of hand hewn timbers, slats and shingle roof and finished with a four-poster bed, large cedar side-board and numerous articles that portray the life of the early pioneers. The new museum houses a comprehensive display of horse drawn vehicles, bullock yokes, farm implements and a completely restored bullock wagon. Also featured is a very fine Dennis fire engine. Another vehicle is a rubber tyred buggy which was used to transport the Queen Mother, then Duchess of York, during her stay in the district in 1927. There is also a photographic display of over 1,000 photos. The complex provides an information centre for visitors. Society meetings are held in the front section of the brick building. This section is also the information centre (which has a comprehensive display of maps, brochures and information for a large area of the south-east corner). The reception room where the meetings are held is also a picture gallery and houses large display cases. This section houses the amenities block, kitchen and strong room. A complete display of dairying is featured in the museum. We have a very few large display of heritage machinery, according to visitors comments it is one of the best collections for a country museum. Our archives is bulging with information and used by many people. Well over 1,000 photographs on display and many more in the archives.